Timing belts in MXL pitch are ideal where a small, synchronous drive is required e.g. Model Making, Instrumentation, Office Machinery. These MXL belts can be used with our range of Aluminium MXL Pulleys. Maximum speed: Up to 20,000 r.p.m. Select from our range of MXL belts below. MXL Rubber Timing Belt, 40 T, 1/4" wide, length 3.2". ..
MXL Rubber Timing Belt, 45 T, 1/4" wide, length 3.60". ..
MXL Rubber Timing Belt, 54 T, 1/4" wide, length 4.32". ..
MXL Rubber Timing Belt, 63 T, 1/4" wide, length 5.04". ..
MXL Rubber Timing Belt, 75 T, 1/4" wide, length 6". ..
MXL Rubber Timing Belt, 80 T, 1/4" wide, length 6.40". ..
MXL Rubber Timing Belt, 90 T, 1/4" wide, length 7.20". ..
MXL Rubber Timing Belt, 100 T, 1/4" wide, length 8.00". ..
MXL Rubber Timing Belt, 120 T, 1/4" wide, length 9.60". 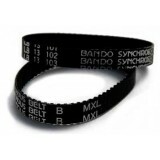 ..
MXL Rubber Timing Belt, 133 T, 1/4" wide, length 10.64". ..
MXL Rubber Timing Belt, 150 T, 1/4" wide, length 12.0". ..
MXL Rubber Timing Belt, 170 T, 1/4" wide, length 13.60". 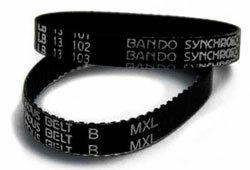 ..
MXL Rubber Timing Belt, 250 T, 1/4" wide, length 20.00". ..
MXL Rubber Timing Belt, 280T, 1/4" wide, length 22.4". ..
MXL Rubber Timing Belt,300T, 1/4" wide, length 24". ..
MXL Rubber Timing Belt, 320T, 1/4" wide, length 25.6". ..
MXL Rubber Timing Belt, 350T, 1/4" wide, length 28". ..
MXL Rubber Timing Belt, 453 T, 1/4" wide, length 36.24". ..
MXL Rubber Timing Belt, 475 T, 1/4" wide, length 38.0". ..
MXL Rubber Timing Belt, 550 T, 1/4" wide, length 44.0". ..